World Central Kitchen believes that food can be an agent of change. That belief has fueled efforts to feed and empower vulnerable communities in the developing world from Haiti to Zambia. The organization is currently working nonstop in Puerto Rico, which is still in the midst of recovering from the devastation of Hurricane Maria. 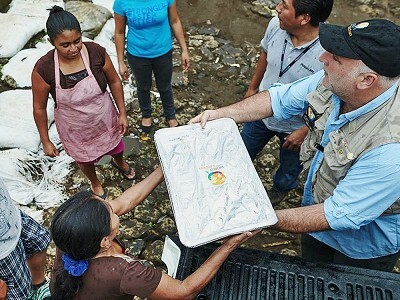 Arriving just after the storm, World Central Kitchen activated its network of chefs, kitchens, food trucks, and partners to ensure people and communities in need receive quality meals. To date, they’ve served 3.6 million meals from 25 kitchens with the help of more than 19,000 volunteers—an impossible task without the right organizational structure, focus, and dedication. While their presence may not be permanent, their impact will be. While cooking, they are educating communities about proper food safety and sanitation. They’ve established school kitchens to support feeding programs. They’ve also provided training and job opportunities to elevate the hospitality workforce, increase earnings, and enhance the quality of life of low-income communities. World Central Kitchen believes that food can be an agent of change. That belief has fueled efforts to feed and empower vulnerable communities in the developing world from Haiti to Zambia. The organization is currently working nonstop in Puerto Rico, which is still in the midst of recovering from the devastation of Hurricane Maria. 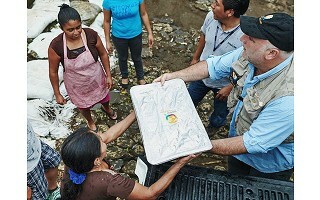 Arriving just after the storm, World Central Kitchen activated its network of chefs, kitchens, food trucks, and partners to ensure people and communities in need receive quality meals. To date, they’ve served 3.6 million meals from 25 kitchens with the help of more than 19,000 volunteers—an impossible task without the right organizational structure, focus, and dedication.